Canada has turned to a political scion to deliver on a promise of change. 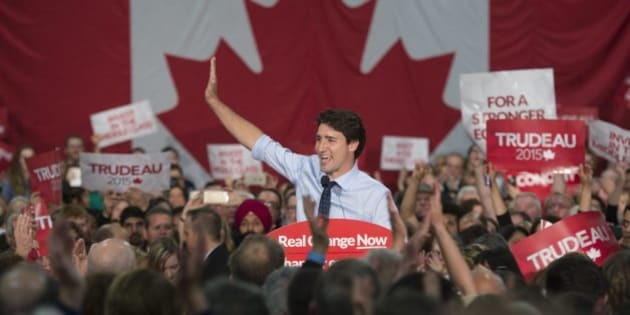 On Monday night, Justin Trudeau's Liberal Party of Canada captured a majority in the 338 seat-Parliament, ending nearly a decade of Conservative governance. Born in the spotlight, Trudeau is the eldest child of Pierre Elliott Trudeau, who led the nation almost continually for more than 15 total years between 1968 and 1984 with a flashy but polarizing style. At just 43, the telegenic younger Trudeau spent a gruelling campaign — Canada's longest since 1872 — beating back the Conservatives' ad narrative that he wasn't ready. First elected to Parliament in 2008, he has spent much of his political career trying to dispel notions that he's more style than substance, more sizzle than steak. Trudeau's ascension marks the end of Conservative Leader Stephen Harper's reign as prime minister. First elected to the job in 2006, Harper is currently the second longest-serving leader in the G7. Although he steered Canada through the global financial crisis of 2008, a hallmark of Harper's legacy will be government secrecy, including the so-called muzzling of federal scientists, and cut-throat politics, marked by attack ads and wedge issues. The win also means sweet redemption for Trudeau's centre-left party. Once among the most successful political parties on the planet, the Liberals were — in the eyes of many — left for dead after after years of declining support culminated in scandal and disastrous 2011 election results. A party of pragmatists, Liberals have long frustrated those on the left or right who favour ideological purity. Liberals, some charge, will pivot to where their interests are best served and stand for little beyond winning. Ready or not, they've won once more. In this campaign, they stood firmly in favour of spending. While his opponents pledged balanced budgets, Trudeau took the bolder option of promising three years of deficits to more than double infrastructure spending. He also vowed to raise taxes on Canada's "wealthiest one per cent" — those, including him, earning more than $200,000 — so that taxes for middle class families could be lowered. Although his plan provided fodder for those eager to dismiss him as a "tax-and-spend" Liberal, he ultimately won on the message that now is the time to invest, not cut back. How much change can the international community expect from Trudeau's government? It depends on the issue. Here are seven ways a new Liberal government might affect the world. Trudeau's party did not support joining the U.S.-led bombing mission against the Islamic State in Iraq and Syria. But Liberals do believe Canada has a role to play in combating ISIS. Trudeau often compared the mission to the 2003 Iraq war led by George W. Bush. The controversial decision of a then-Liberal government not to join Canada's U.S. allies in that effort remains a point of pride for many Canadians. Rather than dropping bombs, the Liberal leader said in his stump speeches, Canada should be helping to train local forces to defeat ISIS on the ground. He has also pledged to increase humanitarian aid. "There's no question that it's absolutely in our national interest to help defeat ISIS, to work with international partners on that," Trudeau said at a foreign policy debate last month. "But how Canada can best help is by doing more of the kind of training of infantry troops on the ground that we developed tremendous capacities to do in Afghanistan and in other places." The refugee crisis in Syria — and a Canadian connection to that heartbreaking photo of a little boy's lifeless body on a Turkish beach — prompted reflection on Canada's role as a generous global partner. At a September debate that was supposed to focus on economic matters, Trudeau accused Harper of shirking his responsibilities on refugee resettlement. The Conservative leader in turn accused Trudeau of wanting to throw open Canada's borders and accept hundreds of thousands of people without security checks. "Yes, we need to be concerned about security," Trudeau responded, "but we don't take that as the excuse to close our doors." In the waning days of the campaign, a damaging report showed that the Prime Minister's Office had ordered immigration officials to stop processing refugee applications last spring until they could be vetted by the prime minister's staff. Harper denied any of his officials were involved in vetting those files. Liberals have pledged to immediately accept 25,000 government-sponsored refugees from Syria — a larger commitment than the one made by the more left-wing New Democratic Party (NDP) to welcome 10,000 before the end of the year. Liberals say they will spend $100 million this fiscal year to increase refugee settlement in Canada, and another $100 million for United Nations refugee programs. In what may come as a surprise to American progressives, Trudeau is doggedly in favour of building a pipeline to carry crude from Alberta oilsands to the U.S. Gulf Coast. It's a position that puts him offside with the likes of Democratic presidential hopefuls Hillary Clinton and Bernie Sanders. Environmental concerns did not factor much into the debate about Keystone in this campaign. The NDP said it opposes the proposal because it would ship jobs to the United States, and the Liberals blasted the Tories for failing to convince U.S. President Barack Obama to sign on. Trudeau even suggested a personal conflict between Harper and Obama was standing in the project's way, publicly accusing the Tory leader of not liking the U.S. president very much. The Liberal leader has vowed to have a more constructive relationship with the White House. The massive Trans-Pacific Partnership trade deal was reached roughly two weeks before Canadians voted. Although the deal was lauded by Tories and opposed by the NDP, the Liberals held their cards close to the vest, saying they wanted to see the fine print of the deal before weighing in either way. That marked a shift away from Trudeau's early and vocal support of the Canada-European Union free trade deal. But Trudeau often repeated that his party is "resolutely pro-trade" and that he would make the case as prime minister that Canada has resources and goods to share with the world. "We have a geographic situation that gives us access across the Atlantic, south to our NAFTA partners, and across the Pacific to the growing markets of Asia," he said at one campaign event. Most expect the Liberals to support TPP in government. In fact, while Trudeau has pledged more free votes for members, Liberals have already said that any future vote on the trade deal would be done as a team. One of the earliest policies associated with Trudeau was his pledge to legalize marijuana so that it can be regulated and taxed. He's said current laws make it easier for kids to access the drug, enriching only gangs and criminals. That commitment, made shortly after he became Liberal leader in 2013, sparked near-constant derision from the Tories, who continue to favour prohibition. The Liberal leader's admission to The Huffington Post Canada that he had smoked the drug while an MP also incited attacks from opponents. In the waning days of the campaign, Conservatives released ads targeting Punjabi and Chinese-speaking voters, warning a Liberal government would like to see marijuana sold to children. Although pot laws were not the issue in this campaign that some had expected, Trudeau did commit to work on legalization "right away." His four-year fiscal plans, however, do not include potential revenue from pot. The Liberal leader said his government will research best practices from jurisdictions around the world that have already legalized the drug. Canada's recent reputation as a climate-change laggard is a sore spot for many who care deeply about the issue. With a global climate conference in Paris approaching in mere weeks, Liberals have committed to putting a price on carbon and ending the practice of setting — and ultimately missing — arbitrary emissions-reductions targets. Their platform also vows to establish a framework for tackling climate change with the provinces within 90 days of the Paris conference, and calls for partnership with the United States and Mexico for an "ambitious North American clean energy and environmental agreement." Of course, the Liberals' commitment to resource development conflicts with research suggesting most oilsands crude should remain in the ground to truly combat climate change. Famed Canadian environmental activist and scientist David Suzuki says he told Trudeau as much when the Liberal leader sought an endorsement this past summer. Suzuki says he ended up calling Trudeau a "twerp" instead. The estimated 1,200 cases of missing and slain indigenous women in Canada is this country's national disgrace, and the international community has taken notice. For years, Harper's Tories have rejected demands to hold a national inquiry into the matter. Those calls grew louder in 2013 when a United Nations special rapporteur on the rights of indigenous peoples endorsed an inquiry to address what he called a "disturbing phenomenon." His later report concluded that human rights issues faced by First Nations had reached "crisis proportions." Last year, a UN Committee on the Elimination of Discrimination against Women said Canada has failed to protect aboriginal women by not exhaustively investigating why they are disproportionately targeted for violence. According to police statistics, aboriginal women in Canada are three to four times more likely to go missing or be killed than non-aboriginal women. Trudeau, who accused Harper of being on the "wrong side of history" on this matter, has pledged to call a full inquiry immediately.